Speaking to me from his home in Byron Bay, Adam Guthrie's voice, founder of a plant-based meal planning app, rings positive and clear through the midday heat and dodgy connection of a Balinese phone-line. It’s thanks to people like Adam Guthrie that there has been a shift in consciousness towards the popularity of veganism and plant-based diets. This conscious consumption amongst all ages and backgrounds is growing as both the mental and physical health benefits of a vegan diet are becoming more widely apparent. Guthrie’s meal-planning app aims to promote and aid the maintenance of a plant-based diet for people with busy schedules, who may find it difficult to initiate and adhere to such a routine. After suffering a heart attack at 39, Adam Guthrie tells how he was informed by doctors that he would be dependent on medication for the remainder of his life. Having maintained a vegetarian diet for many years prior to this, Guthrie described himself as being "in disbelief" that he was even susceptible to suffering a heart attack in the first place. “At the time I thought that being a vegetarian was enough to be healthy,’ he stated. 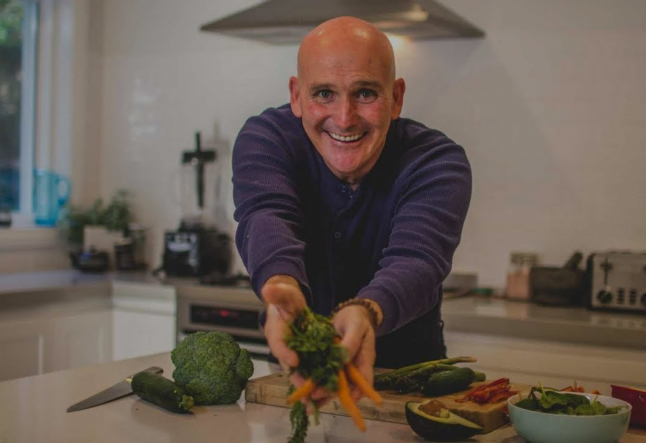 Immediately taking action to avoid a life dependent on medication, Guthrie’s search for alternative treatments led him to discover a whole food vegan diet, which he adopted immediately. Six months later, he had stopped taking all medication, was exercising regularly, weighed 40 pounds lighter, and was "feeling good" for the first time in years. He has since completed an Ironman challenge and been given the all-clear from heart-related illnesses. This misconception, that simply maintaining a vegetarian or vegan diet is enough to ‘stay healthy’, is unfortunately very common. While Guthrie’s story may differ slightly to those committing to the vegan and plant-based lifestyle for spiritual and/or environmental reasons, the key that Guthrie describes as being crucial to understanding and maintaining it is the same - to consciously eat food in the way that nature provides. Not only has it been scientifically proven to have long-term health benefits as studied by renowned nutritionists, vegan diets even have potential reversing-effects for the onset of heart disease. He also shared how the conscious consumption of a plant-based vegan diet is now being prescribed by doctors to patients suffering from all kinds of heart-related illnesses. There is vegetarianism, and there is conscious vegetarianism. There is veganism, and there is conscious veganism. As a busy business-owner, Guthrie admits how he would regularly unconsciously consume copious amounts of junk and fast food, ensuring vaguely that it contained no meat before proceeding to wolf it down, with little or no consideration for the nutritional benefits or actual composition of the food. In his transformation to a full vegan and plant-based diet following the heart-attack, he described how his entire perception and appreciation of food shifted. It began in his mindset with the sudden realization that this diet and method of consuming plant-based foods actually made him “feel good”. “I Feel Good” came as the evolution of a small business idea. It began as a vegetarian café and slowly transformed into an app that is dedicated to providing simple vegan recipes and go-to plant-based meal solutions for busy people. Having been designed “by a busy person”, Adam feels the 5 night meal plans and recipes provided by the app really cater for people on-the-go who wish to maintain a plant-based diet, but who lack the motivation or time to actively seek original and varied recipes. Shopping lists and how-to videos are also provided. Switching to the plant-based lifestyle does not need to be a tasteless life lived off grass and leaves (another unfortunate common misconception!). These recipes are full of flavor that will satisfy even the most refined palate. For people seeking to switch to a vegan and plant-based diet, Adam Guthrie’s main advice is simply to do so consciously, and to inform yourself fully on the benefits of making the change. He lists Forks Over Knives, Cowspiracy, and a variety of different health and nutrition websites as valuable resources dedicated to informing the public and promoting the plant-based lifestyle in a factual and inspirational way.